Self-identified members of “Anonymous” exchange words with an anti-Muslim protester at Oklahoma’s first “Oklahoma Muslim Capitol Day” on Friday. In this video, a man protesting Muslim Day exchanges words with another man identifying himself as a member of the activist group Anonymous. Is Oklahoma home to members of the underground activist group Anonymous, known for national and international hacking exploits? That appeared to be the case on Friday during protests at the State Capitol during Oklahoma’s first-ever “Oklahoma Muslim Day” activities. At least four people stood outside the Capitol’s south entrance, some carrying the signature green and white flag used by the shadowy group. 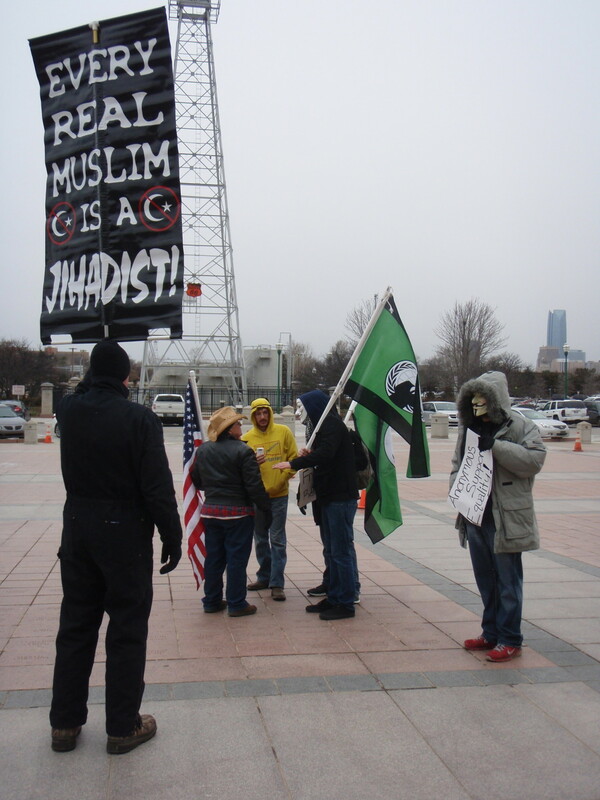 They wore distinctive “Guy Fawkes” masks and said they were there to support the more than 150 Muslims who participated in an event intended to educate leaders and others about the Muslim faith. The self-identified Anonymous members engaged in arguments with some of the two dozen people who protested the Muslim event, and they escorted some Muslims through the protesters. That counter-protester said he and the others with Anonymous, also carrying signs in support of the Muslim gathering, were there to encourage Muslim Day participants. “We showed up to, one, offer support for freedom of religion, and two, offer safe passage at the risk of our own lives,” the Anonymous protester said. However, few at the Capitol seemed to know much about them. “As far as our attendees go, no one knows about them or even who they are,” Soltani said. According to State Capitol security, no one applied for a protest permit for Anonymous, and none were seen inside the Capitol. Some members of Anonymous have been arrested in hacking-related cases, have engaged in conflict with the Church of Scientology, have had run-ins with the Westboro Baptist Church, and were early supporters of Wikileaks, the Occupy movement and the Arab Spring. While the majority of Oklahoma Muslim Capitol Day was orderly and peaceful, one service was briefly interrupted by a woman who was ejected from the Capitol by police. President David Boren said the fraternity students who chanted a racist slogan went beyond free speech, creating a “threatening and hostile environment” that violated other students’ rights.